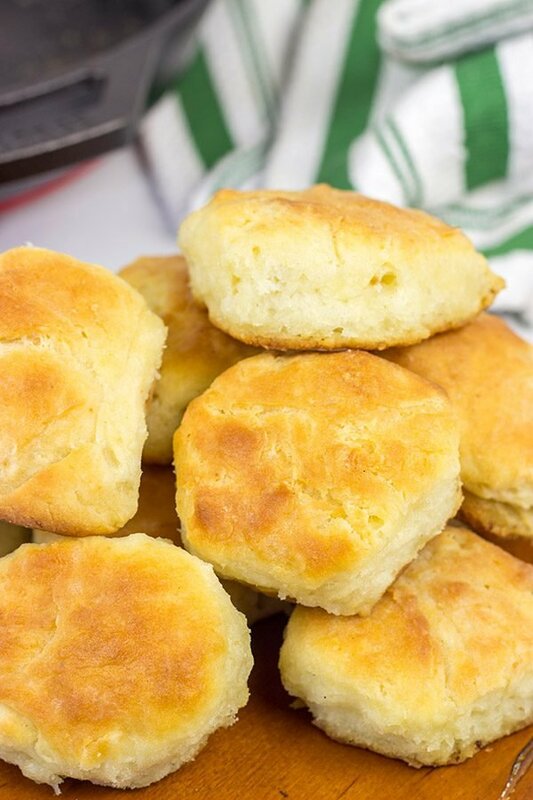 These Cast Iron Buttermilk Biscuits are perfect for weekend mornings! Buttery, flaky and delicious…and they only take about 30 minutes! Cast iron pans were popular in America’s early years, and it’s easy to see why. They could be used for every meal, and they can do double-duty as a weapon to clonk any would-be bandits! (Just kidding…sorta.) I’m not about to go and ditch all my other pots and pans, but a good cast iron skillet can go a long way! Growing up, my mother always kept cans of store-bought biscuits in the fridge. I loved biscuit mornings! A swipe of butter and a spoonful of grape jam schmeared on a hot biscuit is the thing dreams are made of. 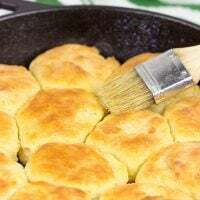 Occasionally (especially on holidays), my mother would leave the canned biscuits in the fridge and whip up a batch of homemade cast iron buttermilk biscuits. Talk about delicious! The crispy edges. One of the reasons why I love using a cast iron skillet for these Cast Iron Buttermilk Biscuits is the crispy edges of the biscuits. The edges turn a wonderful golden brown while the inside of the biscuit stays nice and flaky. Add some grape jam, and I’m all set! Every good cook needs to have a biscuit recipe in their back pocket. This Cast Iron Buttermilk Biscuits recipe is mine. This recipe was passed along from my grandmother to my mother and now to me. Batches of these cast iron buttermilk biscuits have made many appearances over the years, and I suspect they will make many more. One of my favorite things about biscuits is their versatility. We’ve already covered the grape jam for breakfast angle. For lunch, I love slicing leftover biscuits in half and grating cheddar cheese on top. A quick visit to the toaster oven, and you’ve got a delicious warm lunch. And when it comes to dinner, a hot buttermilk biscuit is hard to beat when served alongside a bowl of tomato soup or beef stew! How do you make flaky biscuits from scratch? Secret #2 is buttermilk. That’s not much of a secret since buttermilk is in the recipe title. Seriously, though, use buttermilk. When I first got into baking, I was supremely frustrated with recipes that called for buttermilk. I never kept buttermilk in the fridge, so I’d have to go out and get a container. Inevitably, I wouldn’t use it all, so it would sit in the back of the fridge until I poured it out. But then I stumbled across a powdered buttermilk in the baking aisle at our local grocery store. That’s my go-to source for buttermilk now since it stores easily and I can make as much as I need for the recipe in question. Another option is to make homemade buttermilk by adding a tablespoon of lemon juice or vinegar to a cup of milk. Let that mixture stand for 5 minutes, and you’ve got buttermilk. Either way, take the extra step and use buttermilk to make these biscuits. Your taste buds will thank you! Did you make a batch of these Cast Iron Buttermilk Biscuits at home? Leave a comment! Or snap a photo and tag me on Instagram (@Spicedblog). These Cast Iron Buttermilk Biscuits are perfect for weekend mornings! Buttery, flaky and delicious...and they only take about 30 minutes! Preheat oven to 425°F. Place 9” or 10” cast iron skillet in oven while preheating. Using a medium mixing bowl, combine the flour, baking powder and salt; mix until well combined. Using a pastry cutter or 2 table knives, cut the butter into the dry ingredients until butter pieces are pea-sized. Turn the dough out onto a generously floured countertop or cutting board and shape into a rough 8”x8” square. Using a 2½” round cookie or biscuit cutter, cut the dough into circles. Carefully press together any extra pieces of dough and cut into additional circles as well. 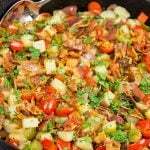 Carefully remove hot skillet from oven and add ½ oz. (1 Tbsp) of butter. Brush butter around bottom of skillet until completely melted. 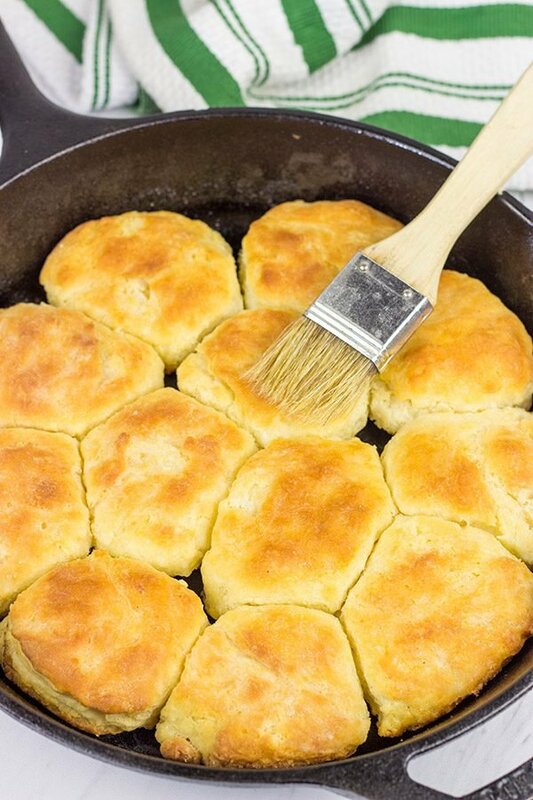 Place biscuits into skillet. 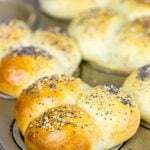 Bake for 20-22 minutes, or until tops are golden brown in color. Remove skillet from oven. Melt the remaining ½ oz. (1 Tbsp) of butter and brush melted butter on top of baked biscuits. Serve hot. Hooray! “Ask and you shall receive!” Last year (year before?) I asked you for a biscuit recipe because, let’s face it, I’m a southerner who uses canned biscuits. Oh the shame!!! Thank you for sharing! Can’t wait to try these! Hope all is well in your corner of the state! Haha! Now that you mention it, I do remember that request, Marla. I made a batch of “angel biscuits” a while back, but they use a bunch of shortening. I’m not a huge fan of shortening, but a reader recently tried the recipe with butter and said it works. I need to try that out now! 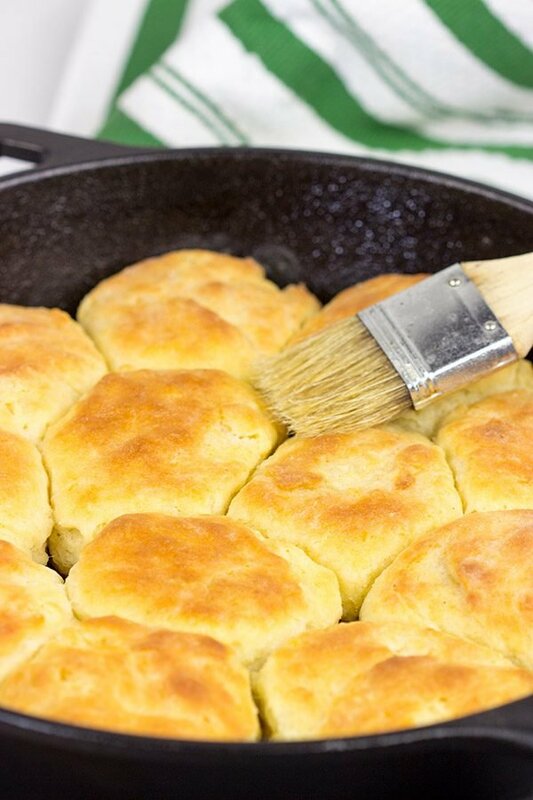 In the meantime, though, this cast iron buttermilk biscuit recipe is a tried and true favorite. I remember growing up to these biscuits in my grandma’s kitchen! 🙂 Hope all is well out in your neck of the woods! I’ve always wanted to learn to make good biscuits and I think now is the time. Yours look amazing! All I can think about now is a warm biscuit with butter so I’m thinking tomorrow I’ll have to satisfy that craving. Hope you have a great weekend! I couldn’t agree with you more, Dorothy. A good biscuit (especially when it’s still warm from the oven) is a thing of beauty! As you’ve noted, they’re so versatile. Jam or honey for breakfast. Cheese or ham for lunch. Gravy for dinner. Spring is indeed on the way up here in New York. We got out yesterday afternoon and let Robbie ride his bike up and down the street. I still needed a jacket, but it was nice to at least get outside for a change! Hope the trees are starting to bud down in your area, my friend! So before I even read anything (aside from the title), I pinned these bad boys. Seriously, these hot outta the oven with butter and jam are, like you said, what dreams are made of….and Dawn’s supper, lol. In my younger years, I didn’t care for cast iron for some reason and now? LOVE it. I use it twice already today! No joke. Send me some, would ya 😉 ??? Happy Friday, David! Haha! I don’t blame ya one bit on pinning these biscuits ASAP, Dawn. A good biscuit is hard to beat! They can seriously be served at every meal of the day…or just by themselves as a snack. I hear ya on cast iron. Sure, it takes a bit of effort to oil the pan and whatnot, but the crispy edges on these biscuits makes it worth the effort! Hope you had a great weekend, my friend! A good cast iron skillet is a great kitchen tool, but sadly I don’t use it that often (And I believe you shouldn’t give it a rest for a long time as it starts losing its quality. Sounds bizzare but I’ve heard it somewhere). One of the things on my list is a pizza in a cast iron skillet – the crust look so amazing! And I have one embarrassing thing to reveal. I’ve never had traditional buttermilk biscuits (Not even those you can get in the department of frozen produce at the supermarket)…and I’ve never tried biscuits&gravy either! I know what you’re going to say. I got it. I’ll go in the kitchen and complete my assignment professor David…one day or another 🙂 Beautiful biscuits here! Haha – who knew cast iron pans had so many uses? I like the double-duty 😉 And these biscuits look DELICIOUS!! Do you know David I’ve never used my cast iron skillet for baking yet? Even though I’ve had it a couple of years! Your cast iron buttermilk biscuits look great. We would call your biscuits, Scones. And yes, hot, smeared with a little butter and some jam, they would be devine. Must try and use my skillet for baking. And soon! Ok, Neil. Here’s your assignment: go pull out your cast iron skillet and bake something! I know cast iron is excellent for other things, too, but I’ve been on a real cast iron skillet for baking recipes lately, too. A pie? Oh man, the texture of the crust is amazing! 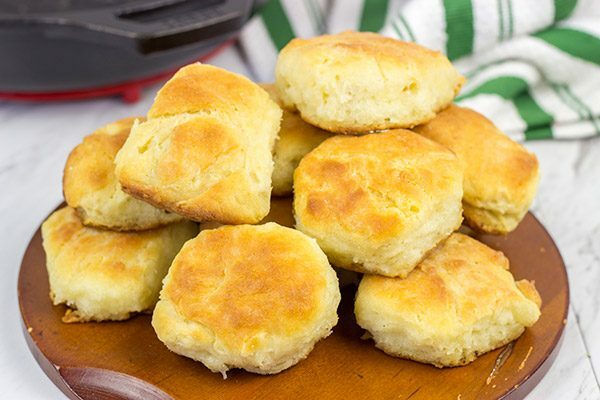 No matter whether you call ’em biscuits or scones, this recipe is a keeper! Thanks so much, my friend! I’m missing my biscuits now. Those look really good, David. Funny, I haven’t thought about biscuits for a while. I really should because they’re good, especially with bacon gravy. Did you ever get in trouble for using the butter knife in the jelly? I sure did. Now I’m thinking about a biscuit egg and bacon sandwich. I think I’ll be making some soon. Thanks for the share. Hahahaha. The butter knife in the jelly jar comment totally made me laugh out loud. I haven’t thought about that in years, but, yes, I did indeed get in trouble for that! All the time! A hot biscuit topped with butter and jelly is a thing of beauty, though. I eat egg sandwiches on toast most days for lunch, but now I’m kinda thinking I need to make a batch of biscuits again. Your comment and a egg + bacon biscuit is making my mouth water! Hope you had a great weekend, my friend! Once again, you’ve read my mind. I was planning to make biscuits tomorrow! Literally tomorrow, and I’ve got buttermilk in the fridge. I have a 10-inch cast iron skillet that’s my everyday, go-to pan. It’s perfectly seasoned and well-used. I fry eggs in it, and they slip right out. (When I tip the pan, that is – otherwise, it’d be problematic.) I’ve never smacked a bandit with it, but I wouldn’t rule it out. You make a good point, Jeff. If your eggs slid right out of the cast iron skillet without tipping it, then you’d have a real problem on your hands. 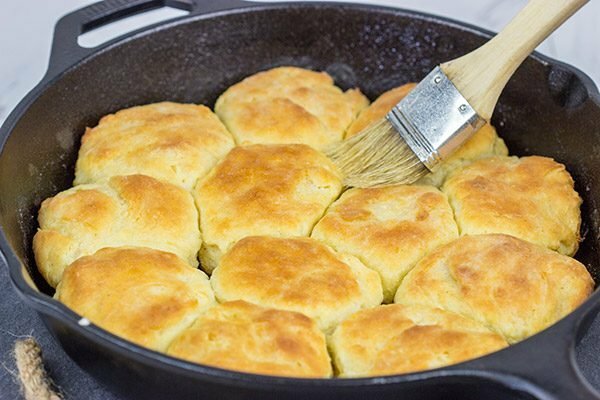 Use that skillet to bake a batch of biscuits! The golden, crispy edges and bottoms of those biscuits is nothin’ short of pure deliciousness. Happy baking, my friend! I don’t use my cast iron skillets nearly enough and I’ve never used them for baking! What am I thinking? 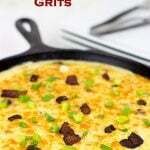 Time to break out the skillet and bake up some biscuits! Yes! You totally should try baking with your cast iron skillets, Kathy. The texture and taste is unique, and I’ve been on a real cast iron baking kick lately! Hope you had a great weekend, my friend! Ooo…apricot jam would be delicious on these biscuits, too, Kelly! Actually, my grandpa always topped his with homemade fig preserves. He had a huge fig tree next to the garage, and he made jars and jars of preserves every year. I didn’t like ’em back then, but man I would love a jar of his preserves now! I think I’ve been on a cast iron skillet kick since I got my first one. I think it makes everything taste even more delicious — and even having the name “cast iron” in a recipe title makes it sound even more delicious. Your biscuits look divine. Oh how I’d love one right out of the oven. Now. 😀 Love everything about this, David!